I have been busy working on other important personal stuffs now a days and really not getting time to cook any special recipes for the blog. Looked into few recipes that were in my draft and thought of picking a simple and quick one to post today so that I can wind up quickly and go the bed. Fortunately, I got a very simple recipe which is nothing but these sesame seeds and Jaggery laddu recipe(Ellu Urundai/ Til Laddu). These laddus are super quick to prepare. It requires only 2 ingredients and often prepared during festival time in India. 1) Dry roast the sesame seeds till it crackles and releases nice aroma. Do not over roast it, otherwise, it tastes bitter. Allow it to cool. 2) Meanwhile, make a powder of jaggery. Keep it aside. 3) In a mixer, take sesame seeds first and make coarse powder. 4) Add powdered jaggery to this and again run it till it reaches fine coarse consistency. 5) Transfer this powder to a plate and shape into lemon size laddus. 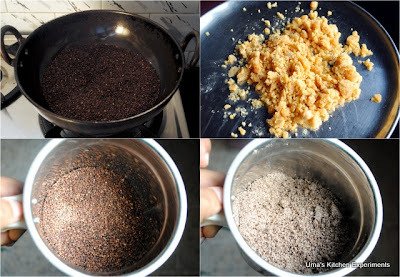 The oil that releases from sesame seeds while grinding is sufficient to bind the laddus. No need to add any other oil. 6) Enjoy the ellu urundais. It has shelf life of 5 days. 1) Try adding palm jaggery for the perfect taste. 2) Instead of black sesame seeds, you can also use white sesame seeds. 3) Add nuts of your choice to this balls to get crunchy taste. Alternatively, you can grind the sesame seeds into a coarse powder to get crunchy taste without adding any nuts. Love the ellu urandai. Amma used to make it on Saturdays for prasadham. Wow so good love the traditional look looks like puja offering love it. I love that bowl.. Looks lovely :) And bookmarking this recipe.. Wanna try out soon !! 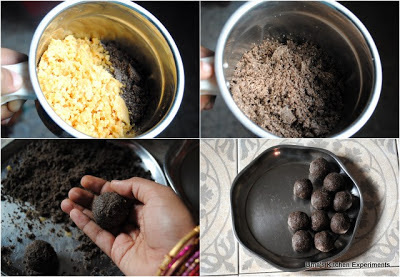 sooperbb clicks.. love to try it..
ah now thats one really easy to make and healthy ladoo..
Good props :) and great clicks! I am totally in love with ur click so good got to try this urundai for sure.